The thing which kept me most stuck emotionally in the early months of my divorce, was waiting for an apology which was never going to come. When relationships end, there is often a sense of injustice; a need to make the other person understand how we feel. Letting go of anger feels impossible if they don’t acknowledge our hurt. Perhaps you’ve suffered betrayal, abuse or other unacceptable behaviour which feels unimaginable to let go of. Maybe you feel like it’s only you knows the real truth, and you can’t be happy while your ex is telling a different version of events. Although it might not feel like it, your happiness doesn’t actually depend on your ex (or anybody else) acknowledging how wronged you were. An apology can feel like a necessary form of closure for some people, but you can move on without one. For me, there was sense of freedom when I realised I did not need my ex-husband to be sorry. My marriage ended against my choice, in the most painful way. But by waiting for his expression of remorse before I could get on with my life, I was putting my future happiness in someone else’s hands. Letting go of the need to be right was the one of the best things I did for moving forward. It stopped me obsessing about my ex-husbands motivations and behaviour. Because I didn’t care so much about how he saw me, I could deal with any continuing conflict more objectively. I learned to pick which battles were the most important going forward. 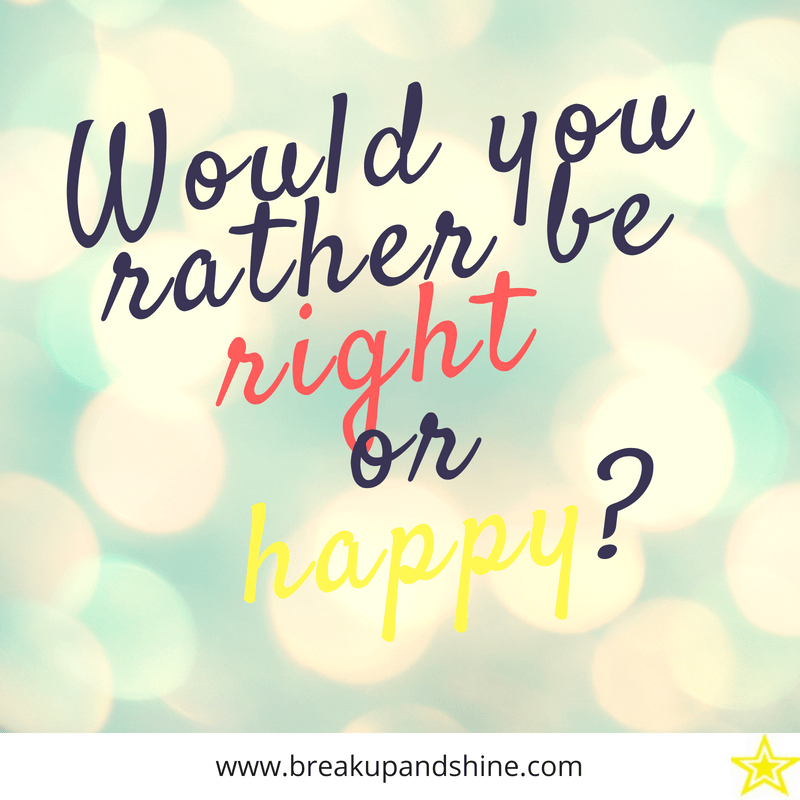 When I found myself getting drawn in to emotional drama I would ask myself “Would you rather be right or happy”. Then, all the energy I had wasted in hoping he would see that I was “right” became focused elsewhere. I spent that energy on my own needs and happiness. And I’m so glad I didn’t hang out for that apology, because 8 years after the divorce it has still never arrived. Now, I no longer need it. Want inspiration and support in getting through the pain of a break-up or divorce? Learn to heal your grief, shift your perspective and start to live life for yourself!